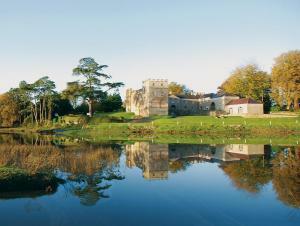 Choose from 30 hotels and guest houses in Dyfed. Shown below a just a selection of the hotels available. To search within an area please use the menu on the right. The Penrallt Hotel near Cardigan is an impressive Edwardian Mansion House set amidst 42 acres of grounds in a peaceful location overlooking the stunning Blue Flag beaches of Aberporth Bay Easily accessed from the main A487, the Penrallt Hotel is just 5 miles from Cardigan in West Wales. The edge of the Pembrokeshire Coast National Park is just 6 miles south west of the hotel with the Ceredigion Heritage Coast to the north. Inland, there are the green pastures of the Teifi Valley. You can also take a trip northwards to Snowdonia or southwards to Pembrokeshire. A choice of dining options includes the award-winning Bay Restaurant, the Conservatory or the Terrace Bar. A small leisure complex provides an indoor pool, sauna, gymnasium and beauty salon. Located on the picturesque promenade in Aberystwyth, The Marine Hotel enjoys a superb seafront position and is just a 10-minute walk from Aberystwyth Train Station. All rooms are en suite with a TV, many overlooking the beautiful Cardigan Bay. Some rooms have a four-poster bed and a luxurious Jacuzzi. Wi-Fi internet access is available in the hotel. The Marine Hotel boasts a well-equipped gym and leisure suite and guests may unwind and de-stress in the Jacuzzi, sauna and steam room. The hotel has a restaurant, lounge and bistro, all with striking ocean views. Aberystwyth Castle is nearby and Aberystwyth Golf Club, set in spectacular meadowland, is a short walk away. This small, friendly hotel with recently refurbished public areas is 5 minutes' drive from Parc Trostre retail park and the new rugby stadium. The rooms have an en suite bathroom and are comfortably furnished. There are many other attractions such as the Wildfowl Wetland Centre and the Millennium Coastal Path. The restaurant menu offers traditional pub food and modern dishes. A former coaching inn, this charming property, dating back over 300 years, occupies a beautiful position in the centre of Newcastle Emlyn, a busy market town at the border of Carmarthenshire and Ceredigion. Newcastle Emlyn is in the Teify Valley, West Wales, which is very popular for Salmon and Sewin (migratory trout) fishing, and is in a very central location, providing easy access both to the coast and to the gentle hills, valleys and rivers that are a feature of the region. Carefully modernised, The Emlyn Arms Hotel now has 16 en suite bedrooms, a 50-seat restaurant and 'Neuadd Nest', a traditional Welsh-styled function suite that is licensed for 400, with a seating capacity for 200. Opposite Parc y Scarlets Stadium, this Premier Inn hotel is a 5-minute drive from the beach and Millennium Coastal Path. Enjoy free parking and family-friendly rooms. 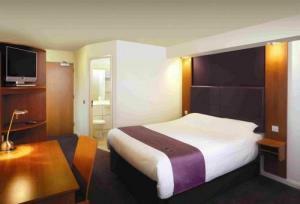 The Premier Inn Llanelli Central East is in South-West Wales, within easy reach of the Gower Peninsula. It's close Parc Pemberton and Parc Trostre retails parks. Some rooms can take 2 adults and up to 2 children (under 16 years). The 2 children also get a free full breakfast when accompanied by an adult eating a full breakfast. The full all-you-can-eat breakfast has the expected cooked items, including vegetarian sausages, as well as a wide continental selection. The hotel has an on-site Beefeater restaurant, serving fresh char-grilled food. Ideally located within easy reach of the town of Newport, this 4-star hotel has stunning views looking out to sea from the heart of the spectacular Pembrokeshire Coast National Park. Nestled within the superb scenery of the Carningli (or mountain of the angels), on the Nevern estuary, the hotel is a great base for a relaxing break. During your stay, you can enjoy a round of golf on the outstanding 80-year-old golf course, go salmon fishing on the best river in Wales or simply walk the best coastline in Britain. 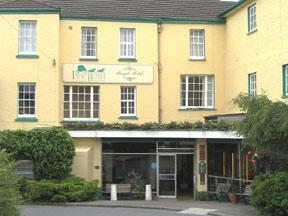 In addition to this, the hotel is only 15 minutes from the port of Fishguard, which takes you directly to Ireland. Newport attracts all kinds of people, from walkers, bird watchers to golfers and fishermen. With its arts and crafts shops and extremely friendly Welsh pubs, Newport has everything. The hotel's friendly staff will endeavour to help arrange the perfect break for you. This stylish, privately owned hotel with apartments is located in the North Gower village of Penclawdd, an excellent location for visiting Swansea, Llanelli or the Carmarthen area. 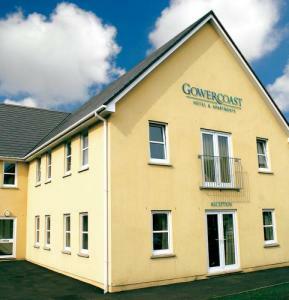 The newly opened Gower Coast Hotel is easily reached from junction 47 of the M4 motorway. 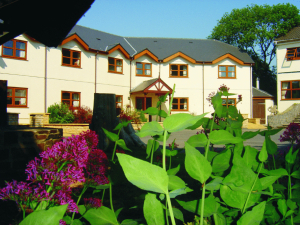 It is ideally located for a stress-free break or to explore the spectacular scenery of the Gower Peninsula. Dog-friendly rooms are available. This hotel with cliff-top terraced gardens has excellent views of the sea and panoramic views of the spectacular sweep of South Beach and Caldey Island Relax in the lounges which also overlook South Beach and Caldey Island, and unwind in the newly refurbished health spa with indoor, heated saltwater swimming pool. The spa also has a spa bath, steam room and heated loungers. The Atlantic Hotel enjoys one of Tenby's finest locations, and all its bedrooms are non smoking with en suite facilities. A lift serves 40 of the rooms. Dine in the relaxed ambience of Carringtons Restaurant, under separate management. Adjacent to the hotel there is a car park for 28 cars with CCTV. 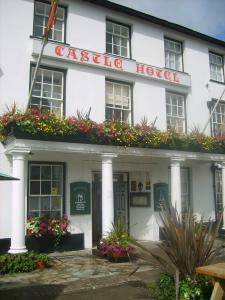 Situated in the historic town of Carmarthen, this traditional inn offers calm and comfortable accommodation, all of which is en suite and equipped with standard facilities. Drovers Arms Hotel has recently been refurbished and the bar room now boasts a traditional quarry tile floor, wooden beams and a log burning stove, as well as a superb bar crafted by local carpenters. The bar serves a wide selection of beers, wines and spirits. Meals may be taken here or in the cosy non-smoking restaurant, serving varied dishes made with fresh local produce. The hotel has a restaurant with 14 tables, which can be used for meetings and private functions, seating up to 50 guests, and a cosy bar with an open fire. It has a mixture of twin and double rooms, but does allow single occupancy in all of them. Set in an unique waterside environment, Slebech Park is a beautifully secluded country estate that offers peaceful, luxury accommodation in the Pembrokeshire Coast National Park. Slebech Park is in the middle of a 600-acre private estate. It has a serene and informal atmosphere, excellent Welsh hospitality and rooms with a simple, chic decor and countryside views. Slebech Park sits on the edge of a tranquil tidal estuary and is well located for the coast path, stunning beaches, Norman Castles and St Davids Cathedral. For dining, The Park @ Slebech has a good reputation and stunning views. It serves local produce, including vegetables from the extensive kitchen gardens. Splendid views and log fires can be enjoyed in the bar. Perfectly situated for places of interest in Pembrokeshire, we are 5 miles from the beautiful Tenby coast, with its long sandy beaches, and shops set within the Old Tenby Walls. We are only a mile away from the very picturesque beach, the village, and harbour of Saundersfoot, and many others besides. We have 24 double/twin rooms, including a disabled room with wheelchair access, wet-room en suite, and an annex for a carer. Just 500 metres from Tenby's popular North Beach and only a pleasant 10-minute walk from the town square, Hammonds Park offers comfortable accommodation in bright, charming en suite rooms. Hammonds Park Guest House has 12 en suite rooms, including twin, double, family and four-poster rooms. Each room is light, spacious and attractive with an en suite bath and shower, as well as a TV and tea/coffee making facilities. Free Wi-Fi wireless internet access is available. Ample free parking is available for guests' use. The guest house is family-run by your hosts, Peter and Lan, who pride themselves on Hammonds Park's friendly, easygoing atmosphere. With pleasant accommodation and a convenient central location, Hammonds Park is a great choice, whatever your reason for visiting the region. With this charming guest house as a pleasant and relaxing base you can explore Pembrokeshire's beautiful beaches and wonderful coastline, have fun at one of the many nearby attractions or enjoy the delights of Tenby town, with its choice of great places to eat and drink. Originally built in 1840, this charming family-run hotel offers free Wi-Fi wireless internet access and free secure private parking, right in the very heart of the market town of Carmarthen. With a great central location, the Spilman Hotel offers traditional, friendly hospitality. All of the rooms are en suite and boast digital TVs, tea/coffee making facilities and mini-fridges. There is a meeting room and a lounge bar. The hotel has its own free private car park for residents, as well as covered parking. Built in 1823, this Georgian mansion hotel is classic yet contemporary, located in acres of grounds, bordered by the Pembrokeshire National Park and the sea. Dine in the candlelit Georgian restaurant, or for a less informal experience, the Conservatory. There is also the option of alfresco dining on the patio in the summer. Whatever you choose from our well balanced menus, you'll enjoy excellent food imaginatively prepared from the finest ingredients. Fresh, locally sourced ingredients are used wherever possible. Enjoy lobster from Freshwater Bay just along the coast, salmon from the River Teifi and lamb from Pembrokeshire's green Preseli Hills. Vegetarian and special diets options are also served. For larger parties and corporate guests, we offer private dining rooms. Our leisure centre boasts a swimming pool, well equipped gym, sauna, jacuzzi, sunbed and treatment rooms. The Boar's Head Hotel is a famous Coaching Inn, steeped in history and dating back to the early 17th Century. Today with the Wales Tourist Board 3*, it offers en-suite facilities in all bedrooms. With its enviable location, the hotel is suited to business travellers, as well as leisure and holiday travellers. We also have two rooms for the disabled with ground floor access. In the Hotel's Olde Worlde restaurant you will find an extensive menu, catering to most palates, serving excellent cuisine all day, every day. The lounge area offers a relaxing atmosphere for either a quiet drink or an informal meal, while our well appointed bars offer a selection of Traditional Real Ales as well as keg bitters, lagers, cider and a wide variety of wines and spirits. We are proud to be a Felinfoel house. The Restaurants and Lounge area, beautifully Oak Panelled, offer a choice of smoking or non-smoking. The popular Carvery is open every lunchtime and is also available for weddings, private parties, etc. The restaurant caters for all with a wide selection of favourite foods such as steaks, fish and vegetarian options. The Hotel has fifteen comfortable letting rooms, each with colour TV showing 10 channels, shave point, en-suite facilities, direct dial telephone, alarm clocks and complimentary hot beverages tray. All rooms are non-smoking. Being a family run hotel, children are most welcome. Our younger guests have their own special menu with all their favourite foods. Cots, highchairs and smaller beds are available at no extra charge. Baby listening monitors are available on request. The secure private car park at the rear of the building will accommodate up to fifteen cars. There is also parking under cover for motorcycles. MAG Members welcome! Carmarthen is an ideal base for touring the beautiful coastline and breathtaking countryside of Carmarthenshire, Pembrokeshire and Ceredigion. This renowned hotel boasts one of the most breathtaking views and marine locations in Wales, overlooking Cardigan Bay, the rugged coastline, the Teifi Estuary and the broad sweep of Poppit Sands. The Cliff Hotel and Spa offers guests luxurious accommodation, with all rooms having en suite facilities and many having a view over Cardigan Bay and the hotel's golf course. Relax in the colonial-style conservatory or in the sumptuous lounge and soak up the atmosphere. Luxurious new spa facilities are ready to offer guests a perfect relaxation zone in which to unwind and indulge. The health spa hosts a salt water hydro spa, steam room, sauna, jacuzzi and gym. In the salon arena there are 4 treatment rooms and a rasul chamber to ease your tensions. The Ivy Bush Royal commands a spectacular position at the gateway to West Wales. Welcomes business and leisure travellers to this beautiful part of the country in considerable style and comfort. The hotel has been fully refurbished and sympathetically modernised to blend its old world charm with modern facilities. There are 70 comfortably furnished bedrooms including 3 family rooms, 4 executive rooms and a two-room suite. Within 150 acres of lush green countryside in the Wyre Valley, West Wales, rests this unique country club and golf complex complete with its own luxury hotel. Designed with the golfer in mind, this holiday destination offers attractions for all the family, however, with extensive sport and leisure facilities and picturesque grounds to explore. Here, you will find comfortable en suite rooms, an indoor heated swimming pool, 27 holes of golf and a new flood lit driving range. Enjoy this family run complex, a warm Welsh welcome, and of course, a game of golf. 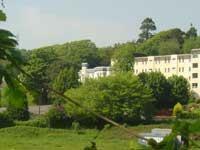 This hotel with spa leisure suite stands in one acre of mature grounds, only half a mile from Tenby's golden beaches. Heywood Mount is a spacious, comfortable and elegant Visit Wales 4-star hotel. It offers free Wi-Fi and plenty of safe parking in the grounds and landscaped gardens. The spa leisure suite has an indoor heated pool, a sauna, a jacuzzi, a gym, a solarium and a resident beauty therapist. Heywood Mount also has a fully licensed bar and an award-winning restaurant.